Smooth. Mighty. We think our Super Greens blend is the best way to drink your vegetables. The broccoli and dark leafy kale, chard, and spinach are sources of vitamins A, C, & K along with iron, potassium and calcium. Those leafy vegetables have some skills. Getting your greens is important and our sippable soup is the least painful way to do it. Because it's not painful at all. Soup it up: Add some blanched, chopped broccoli, toasted almonds or hemp hearts. Serve it up: This soup can be sipped cold or warm. Sweet. Savory. Our Garden Tomato Basil is one of our most beloved staples. The tomatoes are roasted to bring out their natural sweetness, which works even if the tomatoes aren’t at their summery peak. And people seem to be pretty happy about that. The tomato base is paired with onions, carrots, celery, and a touch of basil to make the flavor profile complete. The tomatoes provide vitamins A and C, making it a responsible option that feels more like a guilty pleasure. Soup it up: Add some chopped fresh basil, crème fraiche, parmesan cheese, or toasted bread. Bright. Fragrant. 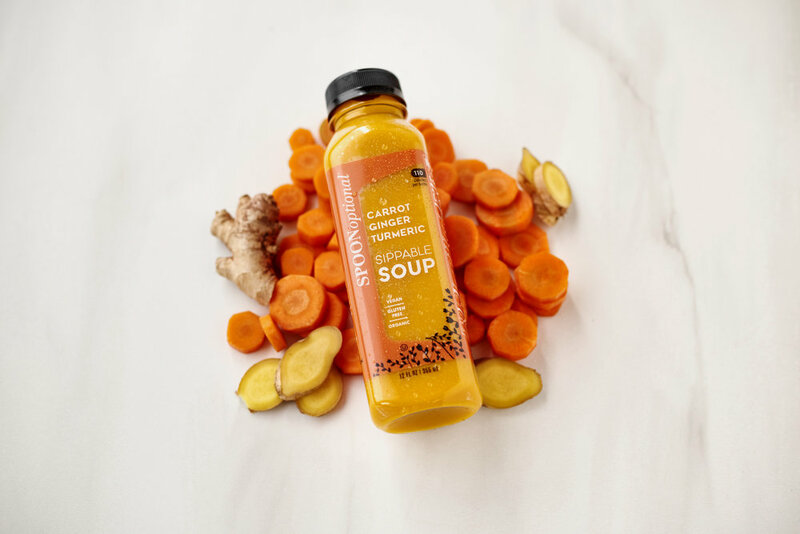 Our version of the very popular Carrot Ginger soup gets a dash of Turmeric. Known for its pungent flavor and potential health benefits, it’s a perfect complement to the soothing qualities of ginger. Carrots provide vitamins A and C, give this soup its vibrant orange color and sweet nuances. This is one mighty soup. Soup it up: Add some toasted pumpkin seeds, toasted sunflower seeds, or Greek yogurt. Earthy. Tangy. Our Beet Cucumber Gazpacho is all work and all play. A nutritional heavy-hitter, stacked with the mild sweetness of red beets, the fresh and crisp finish of the cool cucumber, and a hint of dill for good measure—all wrapped in a vibrant color that’s as delightful for the eye as it is on the palette. This soup brings the best of the beets, providing a great source of folate, manganese, potassium, and copper. It’s pretty, and pretty darn good for you. And what’s not to like about that? Soup it up: Add a swirl of olive oil, diced cucumbers or chopped fresh dill. Serve it up: This soup is best sipped cold.